Our next event is the Summer Fete on Saturday 24th August 2013. This years theme is Children's World. Lots of fun and entertainment for children of any age! If you have any suggestions for us or want to find out more please get in contact with us. 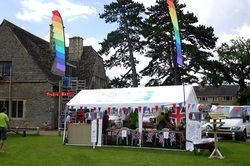 Looking to book a stall for this years fete? Book now before pitches sell out. Looking for a pitch at our car boot sale? Get a booking form now.